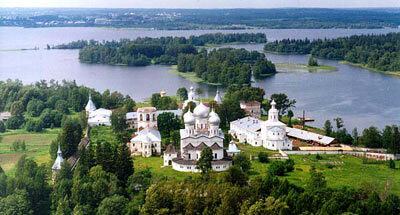 National Park Valdaisky, in the Valdaisky, Demyansky and Akulovsky Districts of Novgorodskaya Region. The Park was founded in 1990. Its area is 158,5 thousand ha. The territory comprises Valdaiskaya mountain ridge in the Valdaiskaya highland. In the relief a combination of hills and lowlands prevails with numerous ravines and streams. 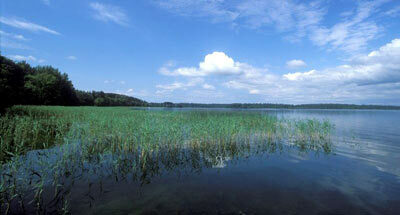 Much of the lowland is occupied by lakes, the greatest of them lakes Borovno, Valdaiskoye, Uzhin, and Velie. The river network is comprised by the river Polomet and its tributaries. 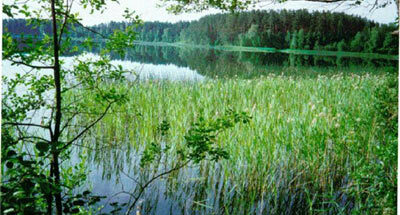 There are 17 plant species in the Red Data Book of the Russian Federation. There are elk, wild boar, brown bear, wolf, fox, otter, marten, European mink, common weasel, lynx, alpine hare, beaver, wood grouse, black grouse, and hazel grouse. Of rare birds are met black storks, fish hawks, and golden eagles. In the Polomet grayling and trout live.